Send a personal check for $25.00 per book (or $45.00 for both Confederate and Union books) to Ron Coddington, 2233 N. Quantico St., Arlington, VA 22205. 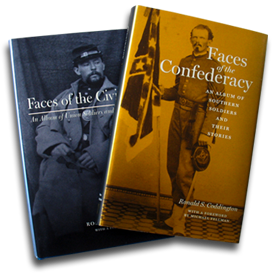 Sign in to your PayPal account and send a $25.00 payment per book (or $45.00 for both Confederate and Union books) to rcoddington@facesofthecivilwar.com. Click the Amazon ad on the top right of this page. When making your purchase, ship the order to the address listed in the first option. In all cases, please email rcoddington@facesofwar.com with any signing instructions (preferred name, specific interest of recipient). All orders will be shipped vis media mail, with the exception of orders placed through N.J. Sekela. Contact Hopkins Fulfillment Services at 1-800-537-5487, or publicist Christina Cheakalos, cac@press.jhu.edu or 410-516-6939. © Ronald S. Coddington. All rights reserved.